(Newser) – More than 100 copies of Anne Frank's The Diary of a Young Girl, plus many other related works that make mention of her or the Holocaust, have been ripped apart recently in Tokyo—the capital of a country where sales of the diary are second only to those in the US. Per Kyodo News, some 265 books in total have been vandalized at 31 libraries since last month, with one library describing its affected books as "unusable" after some 10 to 20 pages were torn from them. 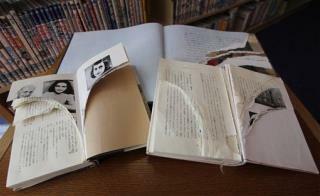 A library worker in West Tokyo adds, "Each and every book which comes up under the index of Anne Frank has been damaged at our library." Dumb asses believe that Anne Frank just made up her story during the holocaust just for kicks.